My favorite restaurant appetizer is easy to recreate at home with this copy cat recipe! It’s warm, flavorful, cheesy and downright addicting! Serve this warm dip alongside crostini, fresh bread, crackers or, my personal favorite, warm bread sticks! 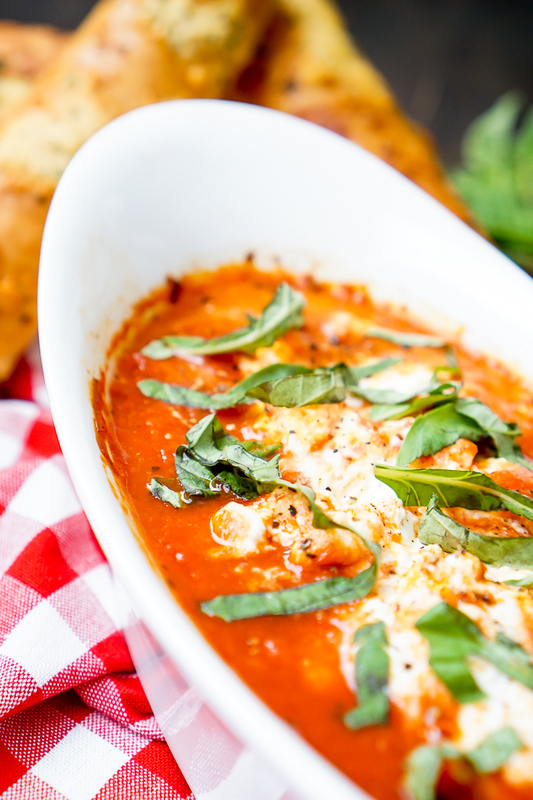 The copy cat recipe for my favorite restaurant appetizer – Baked Goat Cheese Marinara Dip! There was a pizza place a couple blocks away from our apartment in the city called Homeslice. It was my favorite restaurant to hang out with friends – great artisan pizzas with a variety of ingredients and fun names, cute outdoor space, and my all time favorite appetizer – Baked Goat Cheese Marinara Dip! After moving out of the city and away from Homeslice, I found myself missing that Baked Goat Cheese Marinara Dip. It’s that good! So I decided to make a fast and simple version at home, and it was delicious! I don’t think you can really go wrong with a warm dip with sweet, tangy marinara sauce, gooey goat cheese and fresh herbs! Serve this hot appetizer dip with crostini, fresh bread, crackers or, my personal favorite, warm breadsticks. You have to try it with warm garlic breadsticks. We had friends coming over when I decided to throw this together and give it a shot for the first time. Most of the recipes I share on this blog are quick, easy recipes because with our busy schedules, those are the recipes that work best for our lives. I’m sure you can probably relate. You only really need 3 ingredients to enjoy this dip – goat cheese, fresh basil, and a flavorful marinara dip. The other seasonings are recommended for the additional flavor they bring to the dip but are optional based on your personal tastes. With 6 of us hanging out together, this recipe was gone in no time! Again, to keep it easy, I made a batch of 8 breadsticks from the frozen section. That was definitely not enough so we went rummaging for more things to dip with. We used some crackers and left over french bread. 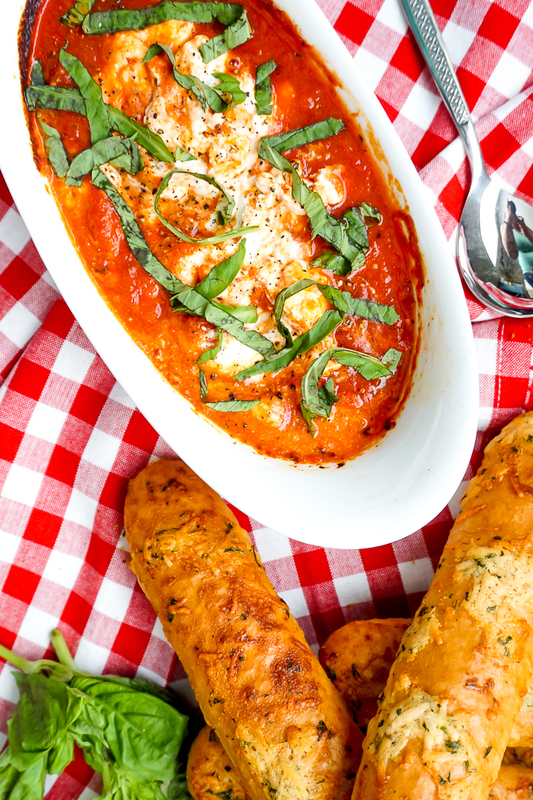 I’m telling you this so you can learn from my mistake – make sure you have plenty of dippers on hand to enjoy every single bite of this Goat Cheese Marinara Dip! This is one of those warm dips that will feel special and convince your guests that you spent a lot of time preparing the appetizer, but it will only take you 5 minutes of prep work and 2 must have ingredients! That’s it! It’s so simple but so warm and satisfying on a cold winter night. Since it only requires two main ingredients, I suggest buying a good, flavorful marinara sauce and a nice goat cheese when you can. None of that means expensive. Just choose products you love the flavor of so they can really stand out on their own! First, press your goat cheese to fit the shape of the dish. I like to leave at least a 1 inch border order the edge to create a moat of sorts for the marinara sauce. Second, spoon in your marinara into the border. I always cover the edges of the goat cheese but try to avoid the top. Third, sprinkle the seasoning of pepper, Italian seasoning and salt on top if desired! Lastly, bake for 20-25 minutes at 375 degrees Fahrenheit. Done! Plus, if you love goat cheese as much as I do, you will want to check out my other Goat Cheese Recipes! TIME TO ENJOY THIS WARM GOAT CHEESE DIP WITH MARINARA SAUCE! 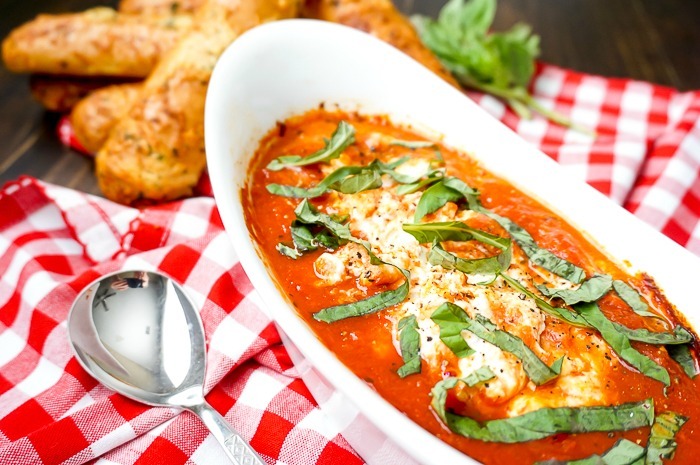 My favorite restaurant appetizer - Baked Goat Cheese Marinara Dip - is easy to recreate at home with this copy cat recipe! It's warm, flavorful, cheesy and downright addicting! In a small baking dish, press goat cheese to fit the shape of the dish, leaving at least a 1-inch border around the edge. Spoon marinara into border, taking care to cover the edge of goat cheese but not the middle. Sprinkle with additional seasoning if desired (pepper, Italian seasoning, and salt). Bake for 20-25 minutes or until goat cheese is hot and marinara is bubbling. Remove from oven and sprinkle with basil. Serve immediately with breadsticks or crostinis for dipping. I hope you have whipped this up and LOVE it! It is so easy to make and delicious. My friends were searching for other things to dip into it when they ran out of the breadsticks too quickly.